Why did you decide to study at Southampton? Southampton was and still is one of the best universities for engineering. I also like ships and the sea, and was quite keen at the time on being a yacht designer, so it seemed the right place for me. What other opportunities did you take advantage of at Southampton? I was a member of the University sailing club and bought a catamaran that I kept at Hamble. A fond memory I have is sitting on a friend's yacht listening to the 1966 Football World Cup off the coast of Cowes, Isle of Wight. What was your ambition when you left University? By the end of my degree I could see that I was not destined to be yacht designer, even though I was still interested in the subject. As my father was an actor, it seemed like a good idea to turn my attention to film design, which could offer wonderful design opportunities. How did you time at Southampton shape your career? I still think engineering was a wonderful degree to do. What my course and time at Southampton taught me is how things work, how to get things done and generally about life. What does your role as Production Designer involve? As a film and television production designer I am in charge of designing and building all the sets and all the props that are needed to make a film. And that can involve a little or a huge amount; sometimes I might be building the inside of the Tardis for the BBC's Doctor Who series and other times it might just involve building a kitchen table. 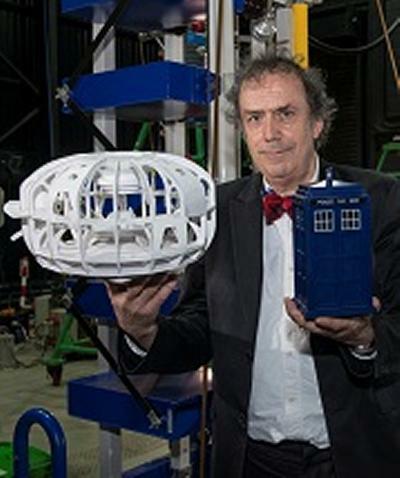 Where does your inspiration come from to design the Doctor Who sets? My inspiration comes from everywhere really. I am always taking ideas from things that already exist in order to create what never existed. As my father William Mervyn (Pickwoad), acted in Doctor Who (The War Machines) with William Hartnell, who played the first doctor, I have grown up with it from the very beginning. How long does it take to go from a desk drawing to a fully designed set? It can depend on whether you have a good construction team around you. Sometimes things are built very fast. One example is when the script changed and we had to build a nuclear submarine in two weeks, complete with a control room and torpedoes. What are the Doctor Who fans like? The fans are extraordinary; if it wasn't for them there wouldn't be Doctor Who. The fans come from all over the world to the conventions and because it is so popular now of course, we had the 50th anniversary celebrations last year. What are you most proud of in your career? On one film, Cruel Train, set in war-time England, I had to build an entire railway in a shed. This involved bringing in steam engines on low-loaders and building the entire station. It was a remarkable piece of work from everyone's point of view. In just four weeks we turned a large shed into a train station with six platforms. What advice would you give to a student who wants to follow in your footsteps? Learn your subject at University very well, because in an art department it is important to have colleagues from diverse backgrounds that know about a variety of things. Then you are more likely to get the designs right.